Water bottles made from PET plastic leach compounds that mimic the hormone oestrogen raising questions about their safety, say German researchers. Previous research has focused on plastics containing the chemical bisphenol-a (BPA). During that time regular PET plastic water bottles have maintained a reputation as safe, at least as far as human health is concerned. 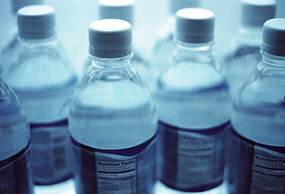 But new evidence suggests that PET, or polyethylene terephthalate, may not be so benign after all. Scientists at Goethe University in Frankfurt found that estrogenic compounds leach from the plastic into the water. It’s too soon to say whether drinking out of PET plastic bottles is harmful to human health, says lead researcher Martin Wagner. But it now appears possible that some as-yet unidentified chemicals in these plastics have the potential to interfere with estrogen and other reproductive hormones, just as BPA and phthalates do. The study adds to growing concerns about products that span the plastic spectrum, says Shanna Swan, an epidemiologist at the University of Rochester School of Medicine and Dentistry in New York. Wagner and a colleague used genetically engineered yeast to analyse 20 samples of mineral water. Nine samples came out of glass bottles, nine were bottled in PET plastic and two were in cardboard, juice-like boxes. The specialised yeast, which change colour in the presence of estrogen-like compounds, revealed estrogenic activity in seven of the nine plastic bottles (and both cardboard samples), compared with just three of the nine glass ones. Overall, Wagner says, levels of these compounds in the water were surprisingly high. German mineral water comes from natural springs. So, to see if the estrogenic compounds were actually coming from the water itself, Wagner emptied the bottles and replaced the water with a pure snail medium and a tiny species of snail that is especially sensitive to estrogenic compounds. Eight weeks later, female snails living in plastic bottles had more than twice as many embryos inside their bodies compared to the glass-grown snails. Wagner cautions against jumping to conclusions. Water is still a healthy beverage, he says. And until the compounds at work in the snail study have been identified, it’s not possible to know if PET plastics pose a human health risk. Still, tests in his lab have shown far less estrogenic activity in tap water than in even the most “ultra-pure” bottled waters. Swan says, it may also be time to reconsider how safe so-called “safe” plastics really are. “I used to say: ‘4, 5, 1, and 2. All the rest are bad for you,'” she says, referring to the recycling codes on plastic products.